It's a loaded lunch! 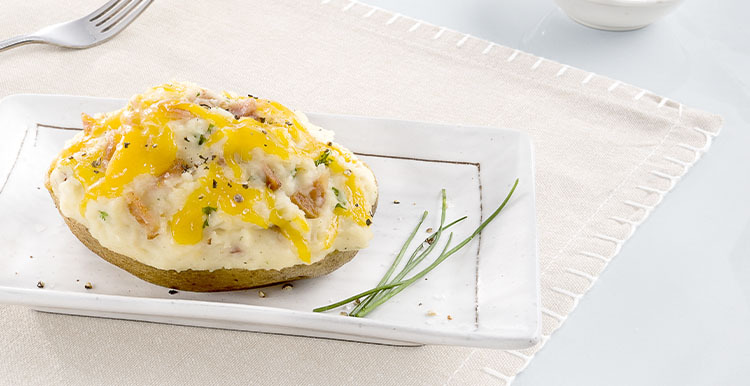 This classic potato is stuffed to the brim with cheddar cheese, bacon and green onions. Ingredients: MASHED POTATOES (POTATOES, SODIUM ACID PYROPHOSPHATE), BAKED POTATO SHELL, WATER, NONFAT MILK (NONFAT MILK, VITAMIN A PALMITATE, VITAMIN D3), WHITE AND MILD CHEDDAR CHEESES (MILK, CHEESE CULTURES, SALT, ENZYMES, ANNATTO COLOR, CELLULOSE), DRIED POTATOES (POTATOES, MONO AND DIGLYCERIDES, SODIUM ACID PYROPHOSPHATE, CITRIC ACID), YOGURT (CULTURED NONFAT MILK), AND LESS THAN 2% OF PRECOOKED BACON (CURED WITH WATER, SALT, SUGAR, NATURAL SMOKE FLAVOR, SODIUM PHOSPHATES, SODIUM ERYTHORBATE, SODIUM NITRITE), VITAL WHEAT GLUTEN, NATURAL FLAVOR (WHEY SOLIDS, ENZYME MODIFIED BUTTER, MALTODEXTRIN, SALT, DRIED BUTTER, GUAR GUM, ANNATTO AND TURMERIC COLOR), CORNSTARCH, WHEY PROTEIN CONCENTRATE, GREEN ONION, RESISTANT MALTODEXTRIN, RICE FLOUR, SALT, SPICES, LACTIC ACID. Nutrients: MASHED POTATOES (POTATOES, SODIUM ACID PYROPHOSPHATE), BAKED POTATO SHELL, WATER, NONFAT MILK (NONFAT MILK, VITAMIN A PALMITATE, VITAMIN D3), WHITE AND MILD CHEDDAR CHEESES (MILK, CHEESE CULTURES, SALT, ENZYMES, ANNATTO COLOR, CELLULOSE), DRIED POTATOES (POTATOES, MONO AND DIGLYCERIDES, SODIUM ACID PYROPHOSPHATE, CITRIC ACID), YOGURT (CULTURED NONFAT MILK), AND LESS THAN 2% OF PRECOOKED BACON (CURED WITH WATER, SALT, SUGAR, NATURAL SMOKE FLAVOR, SODIUM PHOSPHATES, SODIUM ERYTHORBATE, SODIUM NITRITE), VITAL WHEAT GLUTEN, NATURAL FLAVOR (WHEY SOLIDS, ENZYME MODIFIED BUTTER, MALTODEXTRIN, SALT, DRIED BUTTER, GUAR GUM, ANNATTO AND TURMERIC COLOR), CORNSTARCH, WHEY PROTEIN CONCENTRATE, GREEN ONION, RESISTANT MALTODEXTRIN, RICE FLOUR, SALT, SPICES, LACTIC ACID.